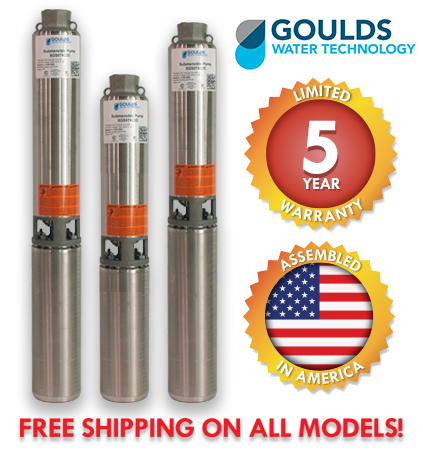 Goulds Stainless Steel 4'' submersible pumps are specifically designed for residential and small municipal water supplies as well as light irrigation applications. Powered by CentriPro Motors The motors feature built-in lightning/surge protection. All have a 700# thrust bearing as compared to our major competitor's 300# and 650# ratings. The 1/2 - 3 HP, 3-wire and all 2-wire models have on- winding thermal overloads. Field Serviceable: Units have left hand threads and are field serviceable with common tools and readily available repair parts. Sand Handling Design: Our face clearance, floating impeller stack has proven itself for over 40 years as a superior sand handling, durable pump design. FDA Compliant Non-Metallic Parts: Impellers, diffusers and bearing spiders are constructed of glass filled engineered composites. They are corrosion resistant and non-toxic. Discharge Head/Check Valve: Cast 303 stainless steel for strength and durability. Two cast-in safety line loops for installer convenience. The built-in check valve is constructed of stainless steel and FDA compliant BUNA rubber for abrasion resistance and quiet operation. Motor Adapter: Cast 303 stainless steel for rigid, accurate alignment of pump and motor. Easy access to motor mounting nuts using standard open end wrench. Stainless Steel Casing: Polished stainless steel is strong and corrosion resistant. Hex Shaft Design: Six sided shafts for positive impeller drive. Engineered Polymer Bearings: The proprietary, engineered polymer bearing material is strong and resistant to abrasion and wear. The enclosed upper bearing is mounted in a durable Noryl® bearing spider for excellent abrasion resistance. The 'C' designation at the end of the pump model states that the pump has a CentriPro motor.